November 2, 2018 Lucio-Ohs are real, and they’re here. The first new product announcement at BlizzCon may not be what you expected. There’s an Overwatch-branded cereal on the way, bearing Lucio’s likeness. Lucio-Ohs are coming – a real breakfast cereal that you can really purchase and eat. For real. The commercial ahead of the BlizzCon opening ceremony might’ve seemed like a joke, but Blizzard continues to insist it’s real, so I guess we’re forced to believe them. The Junk Food Aisle’s rendition of the cereal isn’t quite the same as the in-game version, but it stays true in, arguably, the most important way. The cereal’s little o’s are coloured in the character’s iconic yellow and green. 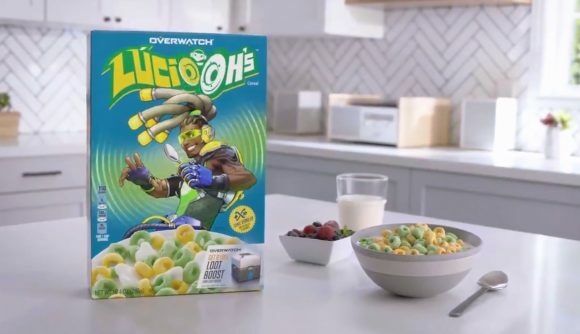 Another detail on the box is the calories per bowl symbol, and from the look of it, a bowl of Lucio-oh’s is 110 calories. The Junk Food Aisle is a food website that specialises in covering everything new in the world of novelty sugary snacks. Over the past few years it’s been active, that has included a variety of weird and wonderful versions of branded snacks, such as pumpkin spice Twinkies, banana flavoured Frosted Flakes, and it even licensed candy such as Breaking Bad blue sky rock candy. The Junk Food Aisle has not supplied a release date or further details saying where or if Lucio-oh’s will be readily available to buy.